Costa NeoRiviera review – sailing date 20 January 2018 The itinerary: My Fly, land cruise was marketed as “Mauritius Stay and Jewels of the Indian Ocean Cruise”; Costa cruise documents listed it as “Heaven by the Sea”. Boarding was scheduled to be in Mauritius, followed by Seychelles, Madagascar and Reunion Island, returning to Mauritius. However due to Cyclone Berguitta, the ship was not able to dock in Mauritius, and Costa Cruises had to move passengers from Mauritius to Seychelles and vice versa. Whilst this was a major logistics enterprise, Costa could have kept passengers informed and handled it a lot better than they did. I boarded the ship on Saturday 20th January at 11.49pm in Seychelles (thereby missing the complete first day there) and was told that I would be charged the full “service fee” of €10 for the remaining 11 minutes of that day. Really? I thought that was a bit rough! Passenger demographics: On this cruise, the ship catered mainly for French, German and Italian passengers, with a few Spanish and very few English-speaking ones. Visas: late on the evening of January 24th, with our daily program, we received a note regarding Madagascar visas. We were advised that we needed to contact Reception by midnight that day regarding the visas and that a temporary visa would be issued on board for €13. When I had contacted Costa, some months prior to sailing, regarding this, I was told that it was every passenger’s own responsibility to get their own visas – mine cost $A80. I was not impressed. Costa Club: Belonging was worthwhile. I joined on line before boarding. I received 50% discount on extra price menu items and also 50% off the “Dinner under the Stars” menu at the restaurant on deck 6. Bottles of wine received a 25% discount, and there were other smaller discounts available on ship’s services and shop items. Cabin 9196 Premium 0ceanview: Not a great deal of room if configured as a double/queen, but ample usable centre space when turned into a twin bed cabin. This also resulted in good access to the window shelf for extra storage. I was travelling solo – it would be a little tight for two. But set up as a twin, the bed lamps are back-to-front as the metal backing faces the nearest bed and the lamp and switch faces the bed opposite! Also, the bedside cabinets open from the middle, back towards each bed, and have no handles. Drawers would be a much better option. Bed and pillows, firm but comfortable, linen very good quality and changed every three days. The desk was good with two Europe/Asia 220w power points as well as two American 110w points; good lighting and large mirror. There is a capsule coffee machine, with cups – bring your own capsules. This can also be used for hot water for tea – but gives just over half a mug – do it twice! Hot water is available from Room Service between 7am and 10pm otherwise phone Reception. There are two triangular cupboards – one on each side of the desk – the hairdryer is stored here. 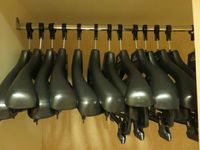 The wardrobe had 14 bulky hangers – that unhook from centre fixture – so annoying and old fashioned! Thin wire hangers were available on request. There were only two shelves – a big gap between, and three drawers – 1½ each? Bathroom: Towels are large and soft – excellent quality and the hand towel was a good size – there is no washer supplied. Towels will be changed when damp – even when hung up – unless cabin steward is instructed otherwise. Liquid soap/shampoo in shower and excellent soap on washbasin. Some toiletries are available on request. Water is hot, adequate pressure. Better than usual quality toilet paper for a ship’s vacuum flush toilet. Safe: this is large and very easy to use, but it is positioned at the front of the cupboard above the minibar (opposite side to the desk), thus completely limiting any other access to this space. Lifts: The forward lift will travel from deck 5 to deck 12 – midship lift will only go deck 5 to deck 9 – with no access to deck 7. Note: You cannot even walk from one end of deck 7 to the other. The aft lift goes from deck 5 (which is not really used as it is at the rear of the dining room) to deck 11 – buffet. Food: available in buffet and dining room also a “pay for” restaurant. Hygiene: there were hand sanitizers at the entrance to all food areas, but these were mainly ignored by the majority of passengers. However, I was not aware of any cases of Noro-virus on board, though what became known as the “Costa cough” was prevalent throughout the ship. Buffet: open for breakfast, lunch, afternoon tea and dinner. Tea and coffee are only available breakfast and afternoon tea. Situated at the rear of deck 11 with an open-air section. Flies can be a big problem after some ports. Costa denies access to FREE, filtered drinking water, except when the buffet is open. All other times one must pay for bottled water. Breakfast: a mix of cereals, yoghurt, fruit, cold cuts (cheese is sliced processed cheese), hot foods – with a separate egg station, and a good variety of bread, pastries and cakes. Lunch: Cold cuts, prepared salads and salad vegetables, cheese (block), fruit, hot foods, breads, a daily roast, about half a dozen desserts, (often mousses) and a pasta station. A hamburger/grill station is outside near the pool – this also serves a late breakfast and late lunch. There is no FREE pizza on board this Italian ship served in the buffet, grill or restaurant! There is a charge of between €7.00 and €8.50. Dinner: I always ate this in the dining room, never in the buffet, so cannot comment. Dining room – breakfast: Similar “serve yourself” fare to buffet (but no flies) with a choice of various “themed” breakfasts – English, American, Mexican, Spanish, German and omelettes to order. Lunch: I didn’t have lunch in the dining room. Dining room is closed on “port days”. Dinner: set time sittings – early at 6.30 – late at 8.45. Menu changed every day. One could go right through all the courses if wanted – appetiser, salad, pasta, mains, dessert, cheese. Be aware that what the menu states may not be quite what you receive! Often lost in translation! Main meal sizes vary greatly - sometimes we received entrée size and at other times a large meal. At nearly all times, green vegetables were lacking. We always ordered two dishes of vegetables for our table of five. The menu also contains “extra price” items. One night I ordered the lobster, which was absolutely superb. The flesh was firm and pearly white – it had been caught locally in Mauritius. As a member of the “Costa Club” I received a 50% discount on the price. Beverages: wine and water could be purchased anywhere on board and taken into either the buffet or dining room – or the bottles could be held over from meal to meal. Lounge areas: there are many to choose from, though some of the chair upholstery could do with a good cleaning. Bar: opening hours and musician times are listed in the daily program. Reception: open 24 hours – knowledgeable and efficient, however there are no “queue” guidelines – this needs to be addressed to cope efficiently with busy times. Shore excursion office: Often very limited opening times – usually closed on port days. Again, this area needs “queueing guidelines” as there was often “push and shove” and “get out of my way” chaos! Make sure you really know what you are purchasing because many tours list “see” when they should state either “view” or “visit” – there is a great deal of difference! Full day excursions were much better value than so called half day ones. Be aware that the buffet will not be open if you are back after 2.30pm – only the grill area. Crew: The lower levels of the crew – cabin stewards and food staff, friendly, but not so the officers – hardly an acknowledgement or a smile given out during the whole cruise. Internet: Three packages available 250mb for €25.00; 500mb for €39.00 and 3GB for €99.00 – all come with a €3.00 “connection fee”, which I thought was a bit rough. It was excellent paying by usage rather than by time as most cruise companies do. I found the internet reasonably fast and efficient – even though sometimes I had to go through 5 steps to log in! And I was in a fairly isolated area of the Indian Ocean. 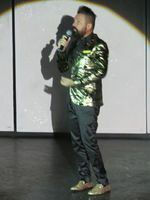 Entertainment: The Cruise Director was a “way out” dresser and he was enthusiastic, but spoke so quickly that it was really hard to know what language he was speaking. I enjoy trivia and quizzes, but some of the entertainment crew had such heavy accents that made the quiz questions impossible to understand. The couple of evening “guest” shows that I saw were quite good – I did not see a “production” show. Library: Open for short periods – seemed to have a good collection of books – but not many in English, as the ship does not really cater for English speaking passengers. There is also a small “swap” section under a window – again no English reading. Pool: there is a small pool, a slightly smaller rectangular spa pool and two hot tubs. Pool chairs are available on decks 11 and 12 and sometimes on deck 6 where there is shade as it is undercover. Casino; Gym; Spa: cannot comment as I did not use these services. Smoking: There is a smoking area on deck 11 (pool deck) and I think there was also one in one of the lounges. Children: children’s activities seem to be well catered for. In summary: I have done over 40 cruises and feel that I can objectively judge this cruise. Costa is just a 3-star cruise line, good in some ways, not good in others. There were many inconsistences and things that certainly could have been managed better. Would I cruise with Costa again, most likely not, except if the itinerary and destinations were exceptional – as this one was. Not much room in wardrobe - pack lightly! The itinerary: My Fly, land cruise was marketed as “Mauritius Stay and Jewels of the Indian Ocean Cruise”; Costa cruise documents listed it as “Heaven by the Sea”. Boarding was scheduled to be in Mauritius, followed by Seychelles, Madagascar and Reunion Island, returning to Mauritius. However due to Cyclone Berguitta, the ship was not able to dock in Mauritius, and Costa Cruises had to move passengers from Mauritius to Seychelles and vice versa. Whilst this was a major logistics enterprise, Costa could have kept passengers informed and handled it a lot better than they did. I boarded the ship on Saturday 20th January at 11.49pm in Seychelles (thereby missing the complete first day there) and was told that I would be charged the full “service fee” of €10 for the remaining 11 minutes of that day. Really? I thought that was a bit rough! Passenger demographics: On this cruise, the ship catered mainly for French, German and Italian passengers, with a few Spanish and very few English-speaking ones. Visas: late on the evening of January 24th, with our daily program, we received a note regarding Madagascar visas. We were advised that we needed to contact Reception by midnight that day regarding the visas and that a temporary visa would be issued on board for €13. When I had contacted Costa, some months prior to sailing, regarding this, I was told that it was every passenger’s own responsibility to get their own visas – mine cost $A80. I was not impressed. Costa Club: Belonging was worthwhile. I joined on line before boarding. I received 50% discount on extra price menu items and also 50% off the “Dinner under the Stars” menu at the restaurant on deck 6. Bottles of wine received a 25% discount, and there were other smaller discounts available on ship’s services and shop items. 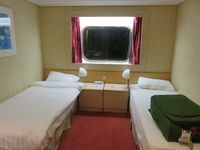 Cabin 9196 Premium 0ceanview: Not a great deal of room if configured as a double/queen, but ample usable centre space when turned into a twin bed cabin. This also resulted in good access to the window shelf for extra storage. I was travelling solo – it would be a little tight for two. 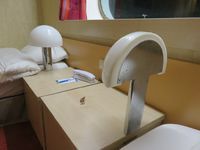 But set up as a twin, the bed lamps are back-to-front as the metal backing faces the nearest bed and the lamp and switch faces the bed opposite! Also, the bedside cabinets open from the middle, back towards each bed, and have no handles. Drawers would be a much better option. Bed and pillows, firm but comfortable, linen very good quality and changed every three days. The desk was good with two Europe/Asia 220w power points as well as two American 110w points; good lighting and large mirror. There is a capsule coffee machine, with cups – bring your own capsules. This can also be used for hot water for tea – but gives just over half a mug – do it twice! Hot water is available from Room Service between 7am and 10pm otherwise phone Reception. There are two triangular cupboards – one on each side of the desk – the hairdryer is stored here. 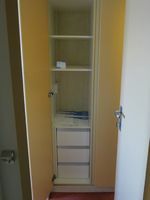 The wardrobe had 14 bulky hangers – that unhook from centre fixture – so annoying and old fashioned! Thin wire hangers were available on request. There were only two shelves – a big gap between, and three drawers – 1½ each? Bathroom: Towels are large and soft – excellent quality and the hand towel was a good size – there is no washer supplied. Towels will be changed when damp – even when hung up – unless cabin steward is instructed otherwise. Liquid soap/shampoo in shower and excellent soap on washbasin. Some toiletries are available on request. Water is hot, adequate pressure. Better than usual quality toilet paper for a ship’s vacuum flush toilet. 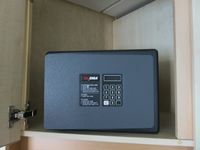 Safe: this is large and very easy to use, but it is positioned at the front of the cupboard above the minibar (opposite side to the desk), thus completely limiting any other access to this space. Lifts: The forward lift will travel from deck 5 to deck 12 – midship lift will only go deck 5 to deck 9 – with no access to deck 7. Note: You cannot even walk from one end of deck 7 to the other. The aft lift goes from deck 5 (which is not really used as it is at the rear of the dining room) to deck 11 – buffet. Food: available in buffet and dining room also a “pay for” restaurant. Hygiene: there were hand sanitizers at the entrance to all food areas, but these were mainly ignored by the majority of passengers. However, I was not aware of any cases of Noro-virus on board, though what became known as the “Costa cough” was prevalent throughout the ship. Buffet: open for breakfast, lunch, afternoon tea and dinner. Tea and coffee are only available breakfast and afternoon tea. Situated at the rear of deck 11 with an open-air section. Flies can be a big problem after some ports. Costa denies access to FREE, filtered drinking water, except when the buffet is open. All other times one must pay for bottled water. Breakfast: a mix of cereals, yoghurt, fruit, cold cuts (cheese is sliced processed cheese), hot foods – with a separate egg station, and a good variety of bread, pastries and cakes. Lunch: Cold cuts, prepared salads and salad vegetables, cheese (block), fruit, hot foods, breads, a daily roast, about half a dozen desserts, (often mousses) and a pasta station. A hamburger/grill station is outside near the pool – this also serves a late breakfast and late lunch. There is no FREE pizza on board this Italian ship served in the buffet, grill or restaurant! There is a charge of between €7.00 and €8.50. Dinner: I always ate this in the dining room, never in the buffet, so cannot comment. Dining room – breakfast: Similar “serve yourself” fare to buffet (but no flies) with a choice of various “themed” breakfasts – English, American, Mexican, Spanish, German and omelettes to order. Lunch: I didn’t have lunch in the dining room. Dining room is closed on “port days”. Dinner: set time sittings – early at 6.30 – late at 8.45. Menu changed every day. One could go right through all the courses if wanted – appetiser, salad, pasta, mains, dessert, cheese. Be aware that what the menu states may not be quite what you receive! Often lost in translation! Main meal sizes vary greatly - sometimes we received entrée size and at other times a large meal. At nearly all times, green vegetables were lacking. We always ordered two dishes of vegetables for our table of five. The menu also contains “extra price” items. One night I ordered the lobster, which was absolutely superb. The flesh was firm and pearly white – it had been caught locally in Mauritius. As a member of the “Costa Club” I received a 50% discount on the price. Beverages: wine and water could be purchased anywhere on board and taken into either the buffet or dining room – or the bottles could be held over from meal to meal. Lounge areas: there are many to choose from, though some of the chair upholstery could do with a good cleaning. Bar: opening hours and musician times are listed in the daily program. Reception: open 24 hours – knowledgeable and efficient, however there are no “queue” guidelines – this needs to be addressed to cope efficiently with busy times. Shore excursion office: Often very limited opening times – usually closed on port days. Again, this area needs “queueing guidelines” as there was often “push and shove” and “get out of my way” chaos! Make sure you really know what you are purchasing because many tours list “see” when they should state either “view” or “visit” – there is a great deal of difference! Full day excursions were much better value than so called half day ones. Be aware that the buffet will not be open if you are back after 2.30pm – only the grill area. 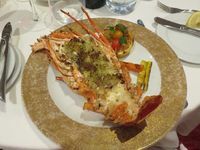 Crew: The lower levels of the crew – cabin stewards and food staff, friendly, but not so the officers – hardly an acknowledgement or a smile given out during the whole cruise. Internet: Three packages available 250mb for €25.00; 500mb for €39.00 and 3GB for €99.00 – all come with a €3.00 “connection fee”, which I thought was a bit rough. It was excellent paying by usage rather than by time as most cruise companies do. I found the internet reasonably fast and efficient – even though sometimes I had to go through 5 steps to log in! And I was in a fairly isolated area of the Indian Ocean. Entertainment: The Cruise Director was a “way out” dresser and he was enthusiastic, but spoke so quickly that it was really hard to know what language he was speaking. I enjoy trivia and quizzes, but some of the entertainment crew had such heavy accents that made the quiz questions impossible to understand. The couple of evening “guest” shows that I saw were quite good – I did not see a “production” show. Library: Open for short periods – seemed to have a good collection of books – but not many in English, as the ship does not really cater for English speaking passengers. There is also a small “swap” section under a window – again no English reading. Pool: there is a small pool, a slightly smaller rectangular spa pool and two hot tubs. Pool chairs are available on decks 11 and 12 and sometimes on deck 6 where there is shade as it is undercover. Casino; Gym; Spa: cannot comment as I did not use these services. Smoking: There is a smoking area on deck 11 (pool deck) and I think there was also one in one of the lounges. Children: children’s activities seem to be well catered for. In summary: I have done over 40 cruises and feel that I can objectively judge this cruise. Costa is just a 3-star cruise line, good in some ways, not good in others. There were many inconsistences and things that certainly could have been managed better. Would I cruise with Costa again, most likely not, except if the itinerary and destinations were exceptional – as this one was.